Princess cruise ships are pleasingly designed, with a variety of major features and intimate spaces. We call it "Big Ship Choice, Small Ship Feel," which means they outfit their ships with all the deluxe amenities that you'd expect from a first-class hotel — from 24-hour room service to chocolates on your pillows at night. Not to mention, their impeccable individual attention. Select a ship below for more details including deck plans, facilities and cruises. If you would like to speak to a member of our dedicated cruise team, call us FREE on 0800 810 8382. Caribbean Princess is the Grand Daddy of our Princess fleet. This ship's 900 balcony staterooms and an entire deck of Mini-Suites offer impressive private vistas. Coral Princess is a luxurious ship, with all the amenities for an amazing cruise. It features an impressive array of dining options, such as specialty restaurants Sabatini's Italian Trattoria and the Bayou Cafe & Steakhouse. Dawn Princess - along with its sister ships Sun and Sea - creates paradise on the high seas. Featuring a wrap-around Promenade Deck, this spectacular ship has more than 400 balcony staterooms. Diamond Princess is a luxury destination in itself. Wake each morning in anticipation of a new horizon. Take in the view from one of nearly 740 balcony staterooms. Emerald Princess is everything you would expect from such a modern, luxurious ship. An extraordinary new cruise experience. Setting sail in Europe in 2020. Golden Princess can take you in style to the places you've always wanted to see. Among this magnificent ship's features are three formal dining rooms, three state-of-the-art show lounges, a variety of pools and much more. Island Princess is a fabulous floating resort designed to make your stay onboard truly memorable. This vessel has 90% ocean-view staterooms - with over 700 balconies and a wrap-around Promenade Deck. 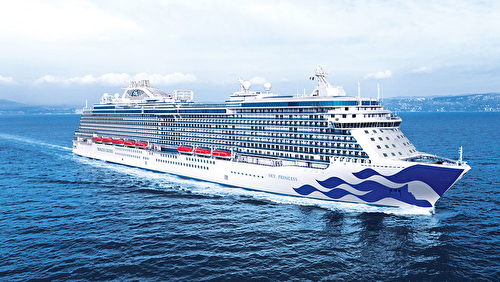 Majestic Princess is the newest addition to the fleet will be based in China year-round and become the first vessel tailored specifically for Chinese guests incorporating a unique blend of international and Chinese features. Pacific Princess is down right intimate in size - accommodating just 670 guests - for an uncommon sense of space onboard. It's an incredible way to enjoy the scenery as well as all the ship's venues. The new Royal Princess® is a gem of a ship, providing a wonderful and intimate ambience for visiting the world's fascinating destinations. Ruby Princess offers the popular Movies Under the Stars, multiple entertainment options, Personal Choice Dining featuring traditional or Anytime seating andLotus Spa with fitness center. Sapphire Princess is a jewel on the high seas - filled with innovative features and luxurious amenities. Swim in one of four sparkling pools, shop the boutiques or get a massage in the Lotus Spa. Sea Princess - along with sister ships Sun and Dawn - carries fewer guests than vessels of comparable size for a feeling of spacious luxury. With more than 400 balcony staterooms, you can enjoy your own exclusive vista. Star Princess is a destination all her own, and with more than 700 balcony staterooms and an entire deck of mini-suites, you can enjoy your own stellar view. Sun Princess, along with its sister ships Dawn and Sea have more than 400 balcony staterooms, so you can wake up to your own exclusive vista.